Ffonic funds more music at the Montgomeryshire Youth Music Christmas Concert/Cheese & Wine event. 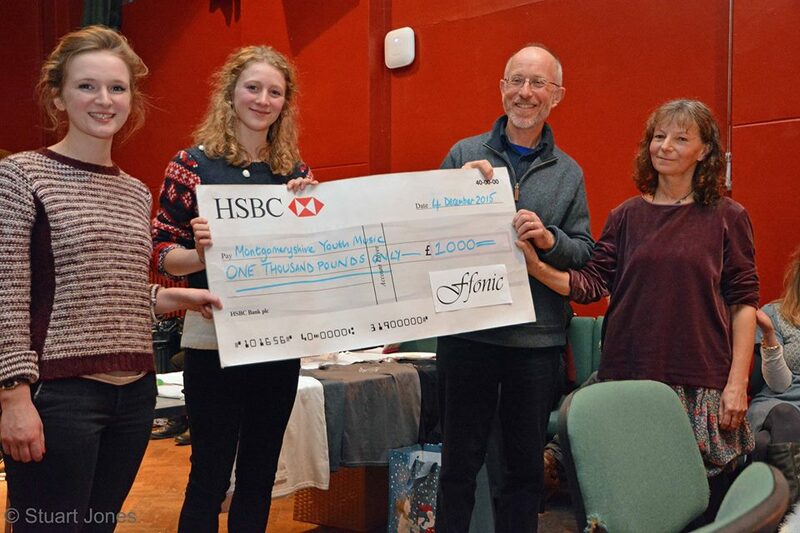 Ffonic (Newtown’s community folk band) has donated £1000 to Montgomeryshire Youth Music with the aim of encouraging more young people to learn an instrument and play music together. The money will be used to help fund a project taking youth orchestra players into local primary schools to play music, demonstrate a range of instruments and introduce young children to the idea of playing an instrument. Ffonic Chair, Geoff Beilby presented the cheque to Anna DuMont and Madeleine Phillips from MYM at the annual Musical Cheese and Wine Evening. ‘We have earned funds from playing for ceilidh dances and concerts, and we are delighted to be able to support the development of music education in our area’, said Geoff. ‘We enjoy having young musicians from the orchestra playing with us in Ffonic from time to time and would welcome more. They get a completely different musical experience, learning to play folk tunes by ear, and we get the benefit of their musical talent’. For information about Ffonic go to www.ffonic.co.uk or phone Geoff on 01686 626082. A further post on the Concert with pictures will follow shortly but in the meantime enormous thanks to the performers, tutors, helpers and lovely audience and to Welshpool High School for being such excellent hosts.